Two 2-year-olds by Ivory James qualified for the $50,000-Guaranteed Oklahoma Juvenile Invitational Saturday night at Remingtn Park. OKLAHOMA CITY, OK--MARCH 9, 2018--A dozen trials were conducted on Saturday at Remington Park to determine the final field for the Grade 3, $371,200 Oklahoma Futurity. The Oklahoma Futurity, the longest-running futurity in the sport of American Quarter Horse racing, will headline a stakes-laden program on Saturday, March 24. The $50,000-Guaranteed Oklahoma Juvenile will also be contested on March 24. The second ten fastest qualifiers from tonight's Oklahoma Futurity trials are preferred invites for the Juvenile. 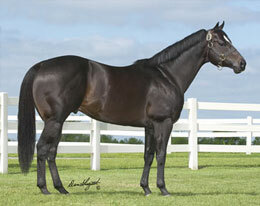 Multiple stakes sire IVORY JAMES sired two qualifiers to the Juvnile. James On The Fly, owned by the partnership of Jose Ernesto Guzman, Jaime Flores and Jorge Cervantes, posted the 18th fastest time from the 141 two-year-old starters to secure a spot in the Juvenile. Amanda Tongay conditions and jockey James Flores rode the gelding out of Strawfly Lady by Strawfly Special. Vaughn and Jill Cook is the breeder. Ivory Runnin, an IVORY JAMES gelding racing for owner-trainer Leonardo Alcala posted the 19th fastest time. Agustin Silva had the riding call aboard the Texas-bred out of Checkhimout Taryn by Check Hom Out. Wayne Wood and Clarence Pruitt is the breeder. CLICK HERE for a complete list of Oklahoma Juvenile preferred invites.